Lemon Basil Quinoa Salad is loved to the last drop! I whipped up this dish for multiple parties this holiday season. Much to my delight, it was a hit everywhere I took it! My dish not only hung with cool foods, like potato salad, pasta salad, and roast beef, it was the first thing gone! My large Italian family ate every drop I brought to our annual Christmas party. I’ve never brought quinoa to a big family event before and I wasn’t sure how it would go over. But everyone ate it, from my old-school uncles to my picky-eater nieces and nephews. I thought I had made a huge batch, over 12 cups, but we didn’t have a bite to spare! I also brought this salad, with the addition of broccoli to it, to a potluck with my girlfriends after Christmas. It paired so well with the Citrus Salmon and Garlic Spinach we had. What a fantastic dinner! With all of that holiday eating, it felt great to indulge in a truly flavorful, satisfying, healthy meal. Packed with Flavor, Fiber, Protein and Allergy-free! This quinoa dish will never let you down. It’s packed with traditional Italian flavors, and has all the fiber, protein, and nutrition quinoa, olive oil, basil, garlic, and lemon bring to the party. Can you ask for anything more? The best of both worlds in my book. But wait, don’t buy yet. It gets better! It’s gluten-free, vegan, sugar-free, nut-free, and soy-free. Safe for just about everyone to enjoy. You will love it! So many people asked for the recipe because they want to make it for New Year’s Eve or New Year’s Day, I’m cranking this post out for you! Please, please enjoy!! Once they've come to a boil add the large pinch of coarse sea salt and pinch of red pepper flakes (for the quinoa). Reduce the heat to medium or medium low, cover to and let quinoa come to a simmer. Turn off heat and let sit for 5 minutes covered. 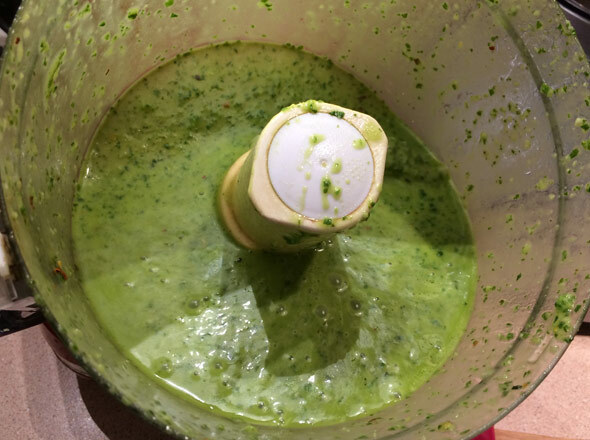 Put all ingredients for the dressing in a food processor and whiz until blended or fully emulsified. Gently stir in 3/4 - 1 cup of the Lemon Basil dressing into the quinoa. Add a few pinches of sea salt to your taste as you mix in the dressing. If using the additional basil, let the quinoa cool a little before adding so the basil doesn't completely wilt and turn brown. I also reserve some of the dressing as the quinoa cools because it's easier to taste the flavors and adjust seasoning once the salad cools a bit. You can make this ahead of time and refrigerate. Just let come to room temperature, toss and adjust seasoning before serving. You can store this salad for 5-7 days in the fridge. Not Sure How to Chiffonade Basil? Watch this short video and learn how to cut herbs and chiffonade basil. Do it with me! Most importantly, eat and enjoy! Mange! !